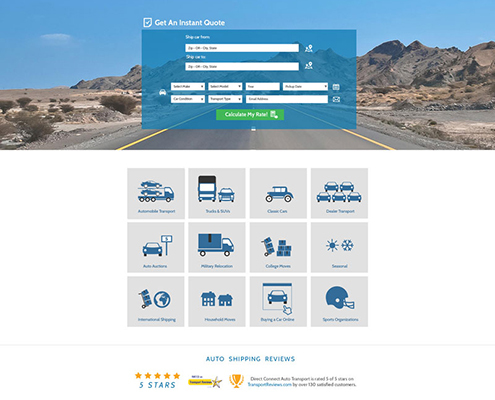 Direct Connect Auto Transport has been a client for over 3 years. In that period we have helped them manage every aspect of their online business. We supported a massive content implementation project that has earned them hundreds of organic SEO visitors every single day for over 2 years. We have consulted with them on link acquisitions and local SEO projects and helped them implement our recommendations. We have also provided social media management, blogging, content marketing and managed their network of websites. This is a great example of 3PRIME’s 360° service philosophy. We work with business owners to drive their vision, and integrate their knowledge, experience and passion into great marketing and website development.